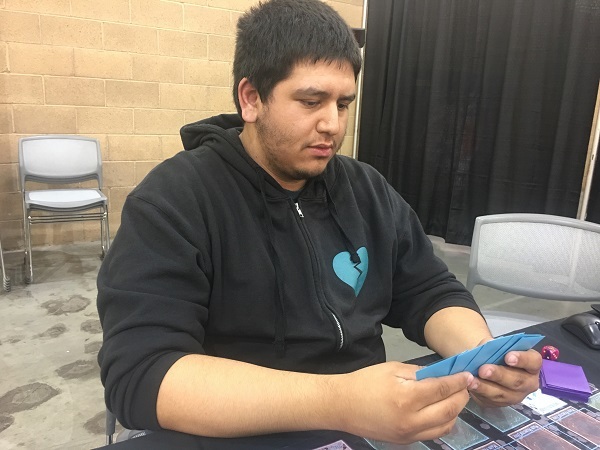 Hidden Summoners is out in full force in this Round 1 Feature Match for YCS Pasadena! 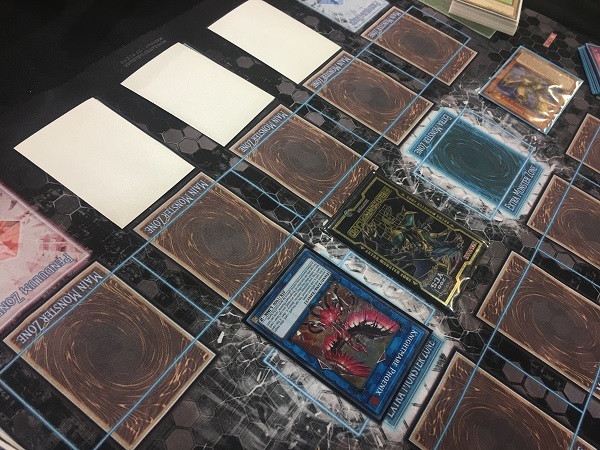 Jon Paredes from Fontana, California and Tevin Collins from Wilwaukee, Wisconsin are both using Decks featuring the new Prank-Kids theme from Hidden Summoners. 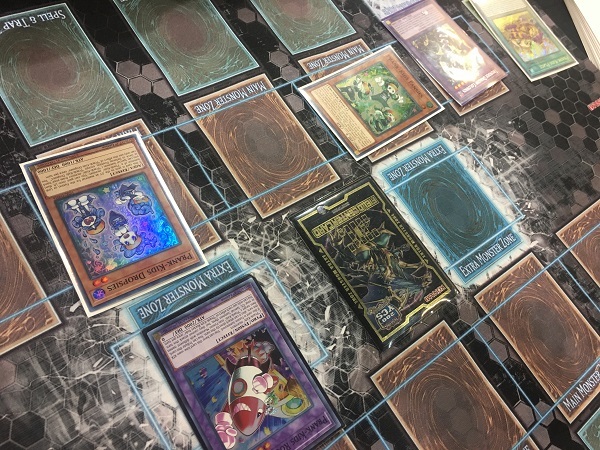 Both Duelists combined this brand-new theme with an older one, attempting to improve on the power of already-popular Decks. Paredes combined the new Prank-Kids cards with the Thunder Dragon cards from Soul Fusion, while Collins combined the Prank-Kids with Sky Strikers. Now they’re facing off in a Match that will determine which Duelist advances with a 1-0 record, and which Duelist suffers a Round 1 defeat. It’s time to Duel! Collins started off Duel 1 by activating Sky Striker Mobilize – Engage! to add Sky Striker Mecha – Hornet Drones from his Deck to his hand. He activated Hornet Drones to Special Summon a Sky Striker Ace Token to the field and then used the Token to Link Summon Sky Striker Ace – Kagari. He used Kagari’s effect to add Engage from his Graveyard to his hand and then activated Engage to add Sky Striker Ace – Raye from his Deck to his hand. He activated Pot of Desires next, banishing the top 10 cards of his Deck face-down to draw 2 cards from his Deck. He then used Kagari to Link Summon Sky Striker Ace – Shizuku and Set a card to his back row. In his End Phase, he added Sky Striker Mecha – Widow Anchor from his Deck to his hand with Shizuku’s effect. Paredes opened up with Terraforming, Prank-Kids Dropsies, Prank-Kids Place, Gold Sarcophagus, Prank-Kids Plan, and Prank-Kids Lampsies. He activated Prank-Kids Place, but lost out on the search to Collins’s Ash Blossom & Joyous Spring. Next, he used Terraforming to add another Prank-Kids Place from his Deck to his hand, and Collins discarded Droll & Lock Bird from his hand to activate its effect and prevent Paredes from adding any more cards to his hand for the turn! Paredes then passed his turn without making any other play. Collins used Shizuku to Link Summon Sky Striker Ace – Hayate and then Normal Summoned Raye. He Tributed Raye to Summon Kagari Linked to Hayate and used Kagari’s effect to add Engage from his Graveyard to his hand. He then combined his 2 monsters to Link Summon Knightmare Phoenix and discarded Mind Control from his hand to use its effect and destroy Prank-Kids Place. He activated Sky Striker Mobilize – Engage! next, and used its effect to add Sky Striker Mecha – Widow Anchor to his hand and draw a card. He Set a card to his back row and then attacked with Knightmare Phoenix before ending his turn. Paredes drew another Prank-Kids Lampsies and then activated Prank-Kids Place. He used its effect to add Prank-Kids Fansies from his Deck to his hand and then activated Gold Sarcophagus! He used its effect to banish Thunder Dragondark from his Deck, and then used Dragondark’s effect to add Thunder Dragonhawk from his Deck to his hand. Next, he discarded Dragonhawk to Special Summon his banished Dragondark and Normal Summoned Prank-Kids Fansies. He Tributed it to Special Summon Thunder Dragon Colossus from his Extra Deck and then attacked Knightmare Phoenix with his Colossus to destroy it. In the End Phase, Dragondark returned to Paredes’s hand as a result of the effect of Dragonhawk. Collins activated Widow Anchor to take control of Colossus and then flipped Prank-Kids Pandemonium! He fused Prank-Kids Dropsies and Prank-Kids Fansies from his hand to Summon Prank-Kids Rocket Ride to his Extra Monster Zone and then used the effects of his Fusion Materials to Special Summon Dropsies and Lampsies from his Deck. He gained 1000 Life Points with Dropsies and sent Prank-Kids Place to the Graveyard with Fansies. He then Tributed Rocket Ride to Special Summon Fansies and Dropsies from his Graveyard and then combined Dropsies and Lampsies to Link Summon Prank-Kids Dodo-Doodle-Doo. He used the effect of Dodo-Doodle-Doo to add another Pandemonium to his hand, and used the effect of Lampsies to inflict 500 points of damage to Paredes’s Life Points and Special Summon Fansies in Defense Position. Next, he Tributed Dodo-Doodle-Doo to add Lampsies and Prank-Kids Place from his Graveyard to his hand. He activated Place and used its effect to add another Lampsies to his hand. activated Pandemonium from his hand to fuse a monster in his hand with one on his field and Summon Rocket Ride, then attacked directly with Colossus, Rocket Ride, and Dropsies to end the Duel! Tevin Collins takes a quick win with his Sky Striker Prank-Kids Deck in Duel 1! Paredes opened up Duel 2 with Gold Sarcophagus, Prank-Kids Place, Prank-Kids Lampsies, Thunder Dragonhawk, and Mind Crush. He activated Prank-Kids Place, but lost out on the search to Collins’s Ash Blossom & Joyous Spring. Next, he used Gold Sarcophagus to banish Thunder Dragondark from his Deck, and used Dragondark’s effect to add Thunder Dragonroar from his Deck to his hand. He discarded Dragonhawk to activate its effect; but Collins Chained the effect of the PSY-Framegear Gamma in his hand! He Special Summoned Gamma along with a PSY-Frame Driver from his Deck to negate the effect. Paredes Set Mind Crush and then passed his turn. In the End Phase, Driver and Gamma were banished from the field. Collins activated Sky Striker Mecha – Hornet Drones to Special Summon a Sky Striker Ace Token to the field, and then used the Token to Link Summon Hayate. He attacked directly with Hayate and used Hayate’s effect to send Sky Striker Mobilize – Engage! from his Deck to his Graveyard. In Main Phase 2, he used Hayate as a Link Material to Link Summon Kagari, and used Kagari’s effect to return Engage to his hand. Paredes flipped Mind Crush, naming Sky Striker Mobilize – Engage!, and forced Collins to discard it. Next, Collins Link Summoned Shizuku using Kagari as a Link Material. He Set a card to his back row, and then added Sky Striker Mecha – Widow Anchor to his hand in the End Phase with the effect of Shizuku. Paredes activated another Prank-Kids Place and used its effect to add Prank-Kids Fansies from his Deck to his hand. He discarded Thunder Dragonroar next, activating its effect to add Thunder Dragonhawk from his Graveyard to his hand. 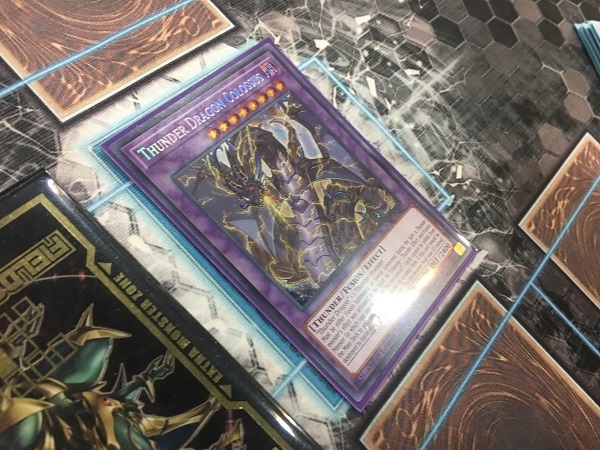 He discarded the Dragonhawk to Special Summon Thunder Dragondark from his Banished Zone and then Tributed the Dragondark to Special Summon Thunder Dragon Colossus from his Extra Deck. He Set Lampsies face-down and then attacked Shizuku with Colossus, destroying it in battle. Collins activated Sky Striker Maneuver – Afterburners! to try to destroy Colossus, and Paredes banished Dragonhawk from his Graveyard to protect it. He then used Dragonhawk’s effect to shuffle the card in his hand back into his Deck and draw Prank-Kids Pandemonium. Collins activated Widow Anchor next, negating the effect of Colossus and taking control of it. He attacked and destroyed Paredes’s face-down Fansies with Colossus and then Set a card to his back row. In his End Phase, Colossus returned to Paredes. Paredes drew Dimensional Barrier and Set it. He attacked with Colossus, dropping Collins down to 4500 Life Points. 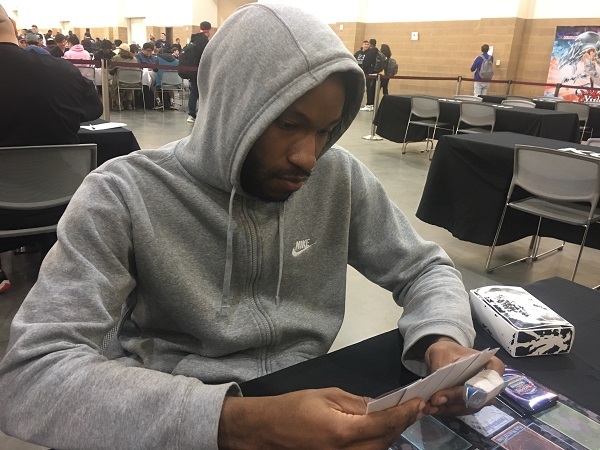 Collins drew a card and passed his turn again, unable to overcome Thunder Dragon Colossus. Paredes drew Instant Fusion. He attacked directly with Colossus and then once again passed his turn. Collins activated Pot of Desires and banished the top 10 cards of his Deck face-down to draw 2 cards. He Normal Summoned Sky Striker Ace – Raye next, and activated its effect to Tribute it and Special Summon Sky Striker Ace – Kagari. He used Kagari’s effect to return Sky Striker Mecha – Widow Anchor from his Graveyard to his hand and then activated Widow Anchor to take control of Colossus. He attacked directly with Colossus and Kagari to drop Paredes down to 1300 Life Points. In Main Phase 2, he combined Colossus with Kagari to Link Summon Knightmare Phoenix. He used its effect and discarded Prank-Kids Fansies to destroy Paredes’s face-down Dimensional Barrier. Next, he used Sky Striker Mobilize – Engage! to add Sky Striker Mecha – Widow Anchor from his Deck to his hand and draw a card. He Set a card to his back row before ending his turn. Paredes drew Prank-Kids Pandemonium, adding it to the Instant Fusion and Prank-Kids Pandemonium already in his hand. He immediately conceded, unable to turn the Duel around. Tevin Collins takes the victory and advances with a 1-0 record using his Sky Striker Prank-Kids Deck!